It's clear that extracting oil and gas from shale formations has led to an economic boom in North Dakota. But what is a plausible estimate of how it will affect the U.S. economy as a whole? The Congressional Budget Office addresses this question in "The Economic and Budgetary Effects of Producing Oil and Natural Gas From Shale" (December 2014). To set the stage for their findings, it's useful to remember three points. 1) The amount of energy used relative to GDP has been declining in the U.S. for decades, with the ongoing shift to an economy where the role for services is relatively larger compared to manufacturing. 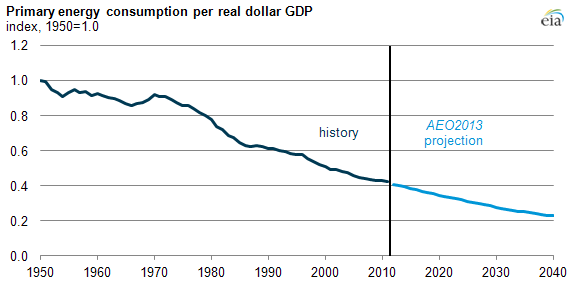 Here's a figure showing energy consumption relative to GDP, with the ratio in 1950 set equal to 1.0. You can see that even in the last couple of decades, since about 1990, the ratio has fallen by about one-third (from .6 to .4). And the projections are that in the next few decades, the ratio will fall by almost another 50% (from .4 to .2). When energy is less important to an economy, it follows that cheaper and more available energy has less of an effect. 2) Oil prices are set in a global market, because oil is transported fairly easily around the world. Thus, any effect of additional U.S. oil production on prices is relatively mild, because it is spread over the global economy. However, natural gas is not transported easily all around the world, and won't be without some major infrastructure investments. So additional U.S. production of natural gas can have a more substantial effect on natural gas prices in the U.S. over the next few decades. 3) When thinking about how shale oil and gas benefit the economy over the long-term, you can't just look at revenues from these products or jobs in these areas. Over the long run, more investment in this area is offset to some extent by less investment in other areas (both in energy and in other industries), and more workers in this area are offset to some extent by fewer workers in other areas. With the US. economy in or recovering from recession in the last six years, the investment and job-creation benefits of additional energy have been especially important, because they are a bright spot in an economy with a lot of slack. Over the longer term, the broader gains from shale oil and gas across the economy arise from a reallocation of labor and capital toward more productive uses. This includes not just those actually drilling for oil and gas, but all the downstream effects of, say, electrical utilities and manufacturing companies that can benefit from lower natural gas prices. Recent advances in combining two drilling techniques, hydraulic fracturing and horizontal drilling, have allowed access to large deposits of shale resources—that is, crude oil and natural gas trapped in shale and certain other dense rock formations. ... Virtually nonexistent a decade ago, the development of shale resources has boomed in the United States, producing about 3.5 million barrels of tight oil per day and about 9.5 trillion cubic feet (Tcf ) of shale gas per year. Those amounts equal about 30 percent of U.S. production of liquid fuels (which include crude oil, biofuels, and natural gas liquids) and 40 percent of U.S. production of natural gas. 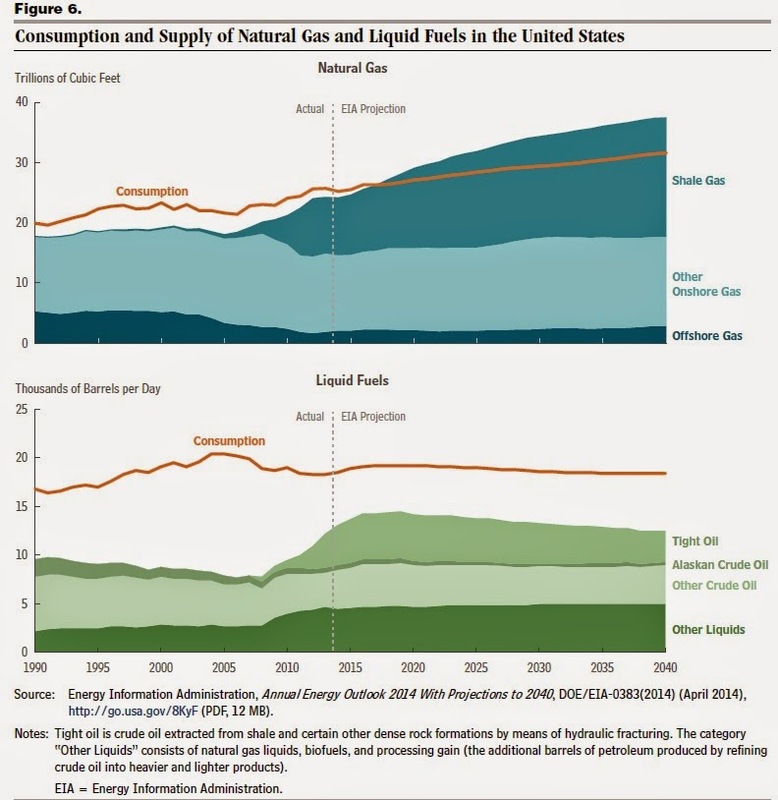 Here's a figure showing overall U.S. production and consumption of natural gas and "liquid" fuels like oil. As you can see, the projections are that the U.S. will be producing more natural gas than it consumes in the near future, but will continue to consume more oil than it produces. Given the current high costs of shipping natural gas outside of North America, it makes some sense (on both economic and environmental grounds) to find ways to expand use of natural gas for electricity generation and manufacturing in place of oil or coal--and indeed, such a shift is already taking place. The CBO report looks at economic gains from shale oil and gas in the short run, and the long run. In the short-run, it lists the following. year, the market value of tight oil, including natural gas plant liquids produced by hydraulic fracturing, was about $160 billion. Combined, sales of shale gas and tight oil therefore totaled about $195 billion, or roughly 1.2 percent of GDP. Increased Demand. Higher employment resulting from shale development, along with a larger capital stock resulting from increased investment in the development and use of shale resources, has led to higher household income and thus greater demand for goods and services. Some of that increased demand has been met by the additional production from the energy-intensive industries described above. However, much of the increase has been for products supplied by firms that do not directly benefit from lower natural gas and oil prices. In order to meet the increased demand, those firms have increased employment and investment, which has raised GDP still further in the short term. United States but does not show up as greater GDP. Specifically, increased net exports of natural gas and oil boost the value of the dollar, making imports cheaper and allowing consumers to buy more and businesses to invest more for a given quantity of exports and a given amount of GDP. CBO has not quantified that effect, however. Reading about a gain of 0.7% of GDP, it's easy to feel a little disappointed or dismissive? All this fuss over 0.7%? Why bother? But to choose a convenient number, say that U.S. GDP is about $20 trillion in 2020. Then, 0.7% would be equal to $140 billion of economic gains. Shale oil and gas is no panacea for the long-run issues facing the U.S. economy, and America is in no way on a path to becoming a resource-dependent economy like Russia or Venezuela. But the U.S. economy is so enormous that no single industry is capable of making a huge difference, not all by itself. Instead, the future of the U.S. economy will need a number of key industries to step up--and it looks as if oil and gas drilling can be one of them. P.S. 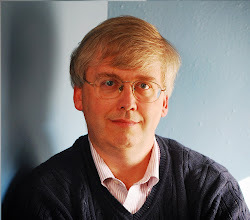 In this post, I've not discussed the environmental issues involved with shale oil and gas. However, in previous posts I've argued that if certain "golden rules" of environmental protection are applied, the environmental benefits plausibly outweigh the costs. Indeed, I support what I call the "Drill Baby Carbon Tax," which would combine moving ahead on developing U.S. fossil fuel resources with all deliberate speed, but also imposing a tax to reduce emissions of carbon, as well as taking step to address other air pollutants and greenhouse gas issues.